How to Fight With a Knife? 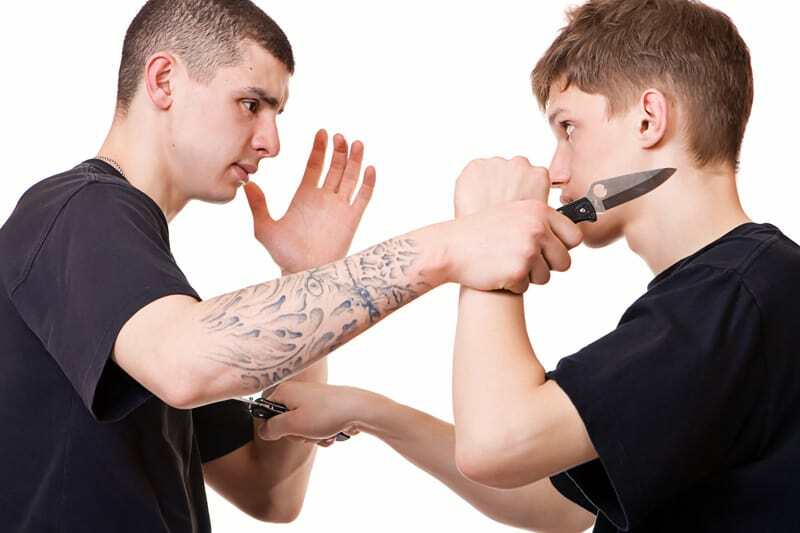 Knife fighting is one of the most vicious and most brutal types of close combat. It’s a physical combat that tests your maximum at both offense and defense. Offensive in the sense that you need to fight to overwhelm your enemy somehow and defensive that you need to protect your neck and abdomen from being lethally cut. If you don’t know how to fight with a knife, it’s most certain that you’ll be wounded as it involves fast slashing and cutting. There are two possible outcomes involved when you fight with a knife. One is disarming your enemy, and the other is to incapacitate him or even kill. Indeed, knives are deadly weapons from the days of yore and surviving being the most important. If you can run away from knife fighting, better do so as there’s no guarantee of you finishing a fight without bleeding. If you’re well aware of the consequences, we will teach you the basics on how to fight with a knife. Please know that you should only confront head on if you have to protect yourself. Never use a knife to threaten or intimidate somebody for personal gain. We know that in this type of fight, it’s life and death situation. You can run if you have the option but sometimes drawing your weapon is the only choice. The following are the steps you must take to learn self-defense against an armed opponent. 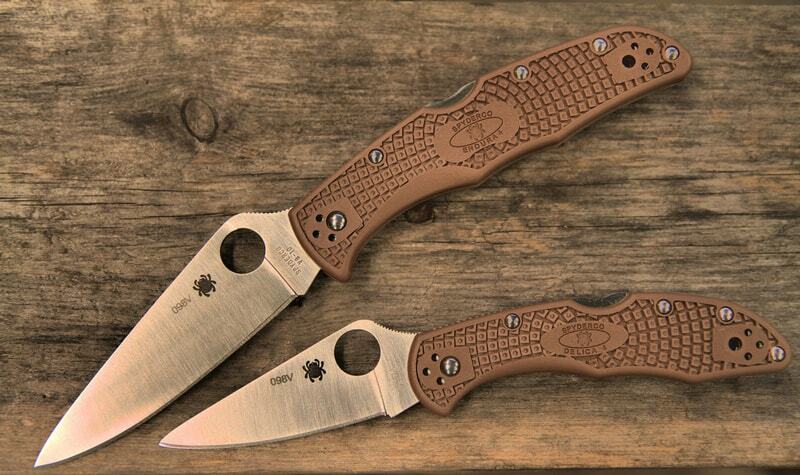 There are types of knives that you are allowed to carry on your person depending on your activity. But in most public places, several knives are illegal and could be confiscated if the law enforcers find out. Knives that are foldable or easily concealed in public are widely banned in most countries. Make sure that you research what are illegal to carry and to conceal on your person in your area. Let’s face it, what would you be most afraid of? An incompetent man who doesn’t know martial arts and is brandishing a knife or an experienced man that can kill with just his bare hands? Obviously, the answer would be latter. If you know your self-defense tactics, it would be easy to disarm a man wielding a knife but can’t fight properly. Knife fighting isn’t just about slashing and cutting where your knives are the only things that move fast. It’s like hand to hand combat because you use your legs to kick, and your free arm to punch. So that’s why if you can’t defend yourself, then don’t even think of carrying a knife. 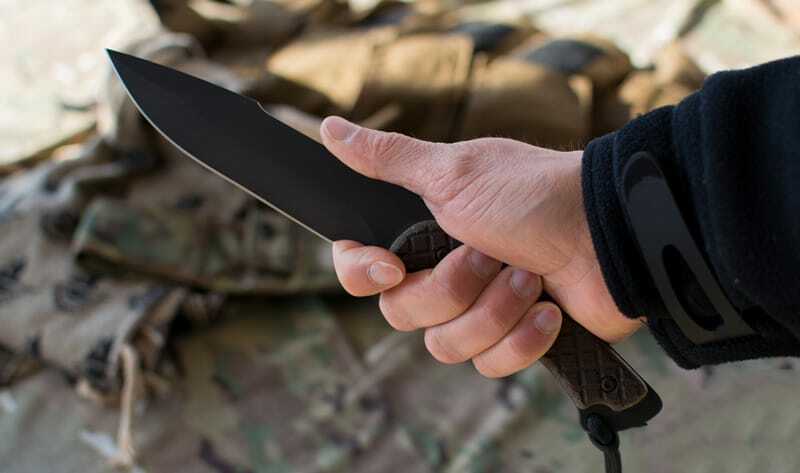 As there are many kinds of knife for tactical, you must experiment which is most useful to you that is comfortable and at the same time stable. In a knife fight, fixed blades are most preferred as you only need to draw it, while foldable knives need to be unfolded to use. 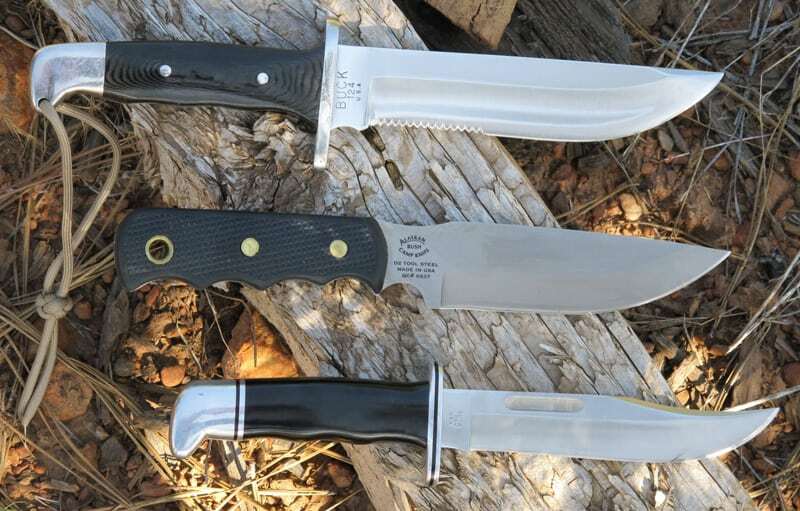 Fixed blades have durable hilts that they won’t fail you while foldable knives can get loose and you might cut yourself instead. 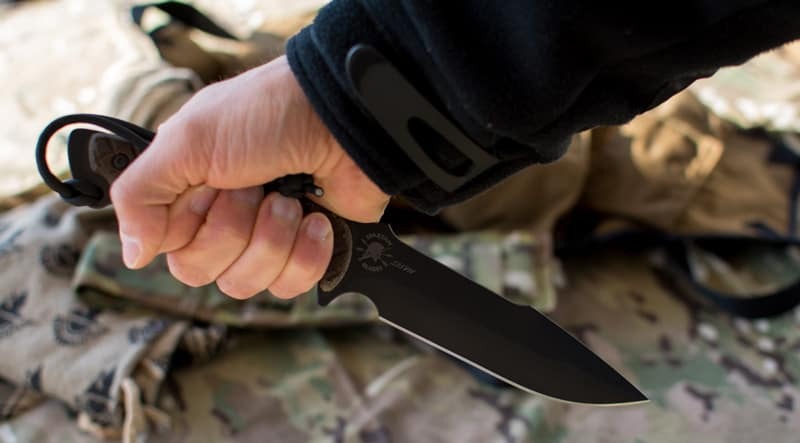 Blades that need springs to unfold are also dangerous in knife fighting as the spring can malfunction, the grip might be too narrow, or small that might just break against a bigger weapon. You should choose between double bladed knives and single blades. Though the double bladed knife can cause more damage to your opponent, it can also hurt you. Think of it as a double-edged sword. Also, you can’t position your thumb on the blade when fighting, but that depends on what grip you use. A knife should be comfortable to both of your hands so the handle must be straight and should have no curves. The curves fitted for your fingers can prove to be a blunder because you won’t be able to grip the knife tightly. It’s an imperative that your knife should be as sharp as ever and won’t need sharpening from time to time. It should be able to cut through your opponent’s veins and other vital organs. How you grip your knife is essential to find what would be most comfortable to you. Also, how you grip can be the course of disarming yourself, so be sure of what would be most fitting for you. Some grips give you more slashing power, and some grips could provide more power for penetration. There are two categories for grips: forward grips and reverse grips. Forward grips allow you for longer reach and more slashing movements. Reverse grips drive for power with each stroke but could be difficult at the same time dangerous because the blade is facing towards you. Hammer grip – it’s the most common grip used by knife wielders. If you grip your knife just like gripping a hammer, where your hand wraps around the handle, and the thumb covers your fist, you can employ many attacks with it. Saber grip – you hold the handle like a hammer, but your thumb is touching the edge of the handle or the blade. Another modification of this grip is your thumb is touching the flat side of the blade. Icepick grip – this type of gripping produces more power in slashing and stabbing motions and is also good in close quarter combat. You hold the handle like a hammer, but the blade is reversed. In fact, this grip along with hammer grip must be learned for optimum chances of surviving. Depending on your grip, you can effectively wound your enemy or can’t do anything at all. Know that there are different ranges in close combat much like fighting physically without weapons. They are divided into three categories: long, middle, and close quarter combat. Long range – Your knife is far from the opponent’s body, but you can make do with his forearms. Hammer grip is an ideal grip that you can use. Mid-range – Your knife can make contact with the opponent’s body but too far away to connect to it continuously. The hammer grip is yet another ideal grip that you can use. Close range – This time around you are very close to your opponent’s body that you can make stabbing motions aside from cutting. The ice pick grip should prove to suffice for this range. You must remember that you only need to draw your weapon when you are threatened and can’t get away from the conflict immediately which gives you the only option to fight. Also, never draw a weapon if your enemy is unarmed as this ploy looks feeble on your part. That’s why you need to learn self-defense so you can fight an enemy on equal terms without you one-upping him. For the instant drawing of your weapon, it’s better to position the knife opposite your dominant hand. If you’re right-handed, hide the knife on your left side body. Practice drawing your knife on many occasions so your hand can get accustomed to instant movements. In knife fighting, you fight to protect yourself and to disarm the enemy. That’s why a balanced position that could make you instantly step forward and step backward is imperative. A fencer’s stance in which you plant your one foot in front of the other is the most preferred stance amongst fighters as you can mobilize your feet into a kick forward or step back to dodge a punch or a slashing knife. In this kind of brutal fighting, you need to protect your main body that can be gravely wounded. This includes your face, throat, stomach, and the chest area. The proper posture for your free hand should be able to shield your vitals in a way that your arm is the barrier. You may get cuts on your forearms, but that’s better than an enemy lunging for your body without even trying to cover it. Your knife should be the buffer between you and the enemy. With your knife forward, you can keep your body safe behind it as you can protect yourself. It gives you plenty opportunities to get close to your enemy to wound him. As you’re doing knife fighting for your own self-defense, your reflexes should be fast to dodge slashes and kicks from the enemy. As your mobility that involves footwork and hand movements, you must maximize your limits to finish the fight still standing up. There’s no way that a fight will end because you want to stop it on a whim, you can only stop a knife fight by incapacitating the other. Remember that you’re only fighting because you have to protect yourself and not to kill. Aiming at the weapon of your enemy can massively help you in winning as you have the advantage over the other because you still have your weapon. He will no longer be a threat to you because you are already a threat to him. Learning the basics above can improve your chances in knife fighting. Learning how to fight with a knife improves your chances of living another day. Though you’ll most likely get cut, you must remain mentally strong so that you have to fight to prevent more grievous wounds that can cost you your life.